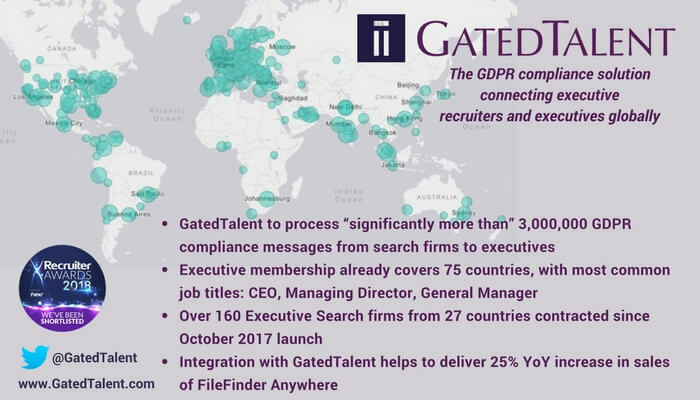 GatedTalent, the GDPR compliance platform connecting executives with executive recruiters globally, is proud to announce that senior executives from 75 countries have already created profiles on the platform to get “on the radar” of Executive Search firms. The talent pool continues to grow daily with invitations being sent by more than 160 retained executive search firms from more than 27 countries. Based on data released to the stock market, the talent pool being created is of an exceptionally high level. The most frequently seen member current job titles are “Chief Executive”, “Managing Director” or “General Manager” and a large proportion of the executives are understood not to have profiles on public sites such as LinkedIn and Xing. The AIM Stock Exchange announcement made on April 27, 2018 also stated that the success of GatedTalent helped deliver a 25% YoY increase in sales of FileFinder Anywhere, the leading Cloud Executive Search software provided by Dillistone Systems, another Dillistone Group Plc company.